This post is written by NCTE’s North Carolina P12 Policy Analyst Bryan Christopher. It is the fifth part of a series about Wildin Acosta, an undocumented student. You can read the first part here, second part here, third part here, and fourth part here. On Tuesday, June 13, Wildin Acosta received his high school diploma. His walk across the stage took only a few seconds, but for many in the audience, it marked the end of a most remarkable journey. Wildin fled gang violence in 2014 from Honduras. After traveling by foot and bus through Guatemala and Mexico, he turned himself in to immigration officials at the border and was later released to join his parents in North Carolina. He enrolled at Riverside High School in 2014, earned good grades, and got involved in clubs and organizations. Then, in January 2016, he was arrested, detained, and set for deportation. 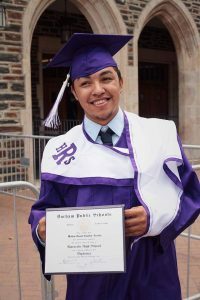 Thanks to the help of students, teachers, community organizations, and elected officials, the Department of Homeland Security halted his deportation and eventually released him from a detention center in Georgia so he could finish his high school coursework and graduate. After answering a few questions from the press after the ceremony, Wildin posed for photos with friends, hugged his teachers, and left to share a meal with his family. It was a great day for everyone who helped restore his right to earn a diploma, an opportunity that all public school students, regardless of immigration status, deserve. Enrique’s Journey by Sonia Nazario—The true story of a 17-year-old boy who journeys from Tegucigalpa, Honduras, to North Carolina to reunite with his mother, only to find new challenges as an undocumented adult in America. Esperanza Rising by Pam Muñoz Ryan—Family strife forces a mother and her 13-year-old daughter to leave their life of privilege in Mexico and join their former cook and gardener at work as migrant farmers in California’s San Joaquin Valley. La Linea by Ann Jaramillo—A brother and sister leave their small town in Mexico for the United States. Navigating danger and tragedy throughout, they travel by bus, train, truck, and foot to join their parents in California. Ask Me No Questions by Marina Budhos—Two Muslim girls—Nadira and Aisha—and their parents emigrate from Bangladesh to the United States, overstay their visas, and build a life in America. After 9/11, border agents detain their father, and the girls must clear his name of terrorist ties and navigate his immigration court proceedings. 90 Miles to Havana by Enrique Flores-Galbis—Three brothers flee the Cuban revolution and experience bullying, betrayal, kindness, and friendship in a refugee camp in Miami while their family finds a way to illegally enter the United States. Wildin was never a student of mine, but when I saw how his classmates reacted, fighting for his right to graduate, it changed the way I thought about policy and my community. Before he was arrested, immigration was an overwhelmingly complex issue that I knew I could not resolve. But once I saw it through the lens of a single story—his story—it moved me to take action. Everything about it was uncomfortable—the time demands, the “hard asks” I made to elected officials mere moments after meeting them, and perhaps most of all the fear of coming up short and disappointing my students—but it was also a career-defining experience that grew my own capacity to lead and serve my students. This school year, implement texts that provide personal perspectives to help students comprehend complex issues and develop solutions of their own. You never know what it might inspire them (and you) to do. 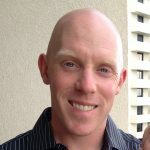 Bryan Christopher teaches English and journalism at Riverside High School in Durham, NC. He is also an NCTE Policy Analyst and Hope Street Teacher Voice Fellow. Follow him on Twitter: @bryanchristo4.